Low power devices are always intriguing, as they open up possibilities for applications with the need to operate remotely, or for very long periods without attention. There are all manner of techniques for powering such devices, too, such as using solar panels, super capacitors, or other fancy devices. The Micro Power Snitch is one such device, which can report wirelessly on your AC-powered appliances. The device is built around a tiny ARM microcontroller and an RFM69 radio module. The entire circuit is run by leeching power from an AC current transformer, wrapped around one of the power lines of an AC appliance. When an appliance draws over the minimum threshold current (500W on 230VAC, 250W on 115VAC), the device sends a packet out, which can be received and logged at the other end. The best part of this project, however, is the writeup. The project is split into an 8-part series, breaking down the minutiae of the concepts at work to make this possible. It’s a great primer if you’re interested in designing low-power devices. We’ve seen some of [jcw]’s power research before – such as this guide to the effects of code on power consumption. A fully stocked freezer can be a blessing, but it’s also a disaster waiting to happen. Depending on your tastes, there could be hundreds of dollars worth of food in there, and the only thing between it and the landfill is an uninterrupted supply of electricity. Keep the freezer in an out-of-the-way spot and your food is at even greater risk. Mitigating that risk is the job of this junkbox power failure alarm. [Derek]’s freezer is in the garage, where GFCI outlets are mandated by code. We’ve covered circuit protection before, including GFCIs, and while they can save a life, they can also trip accidentally and cost you your steaks. [Derek] whipped up a simple alarm based on current flow to the freezer. A home-brew current transformer made from a split ferrite core and some magnet wire is the sensor, and a couple of op-amps and a 555 timer make up the detection and alarm part. And it’s all junk bin stuff — get a load of that Mallory Sonalert from 1983! Granted, loss of power on a branch circuit is probably one of the less likely failure modes for a freezer, but the principles are generally applicable and worth knowing. And hats off to [Derek] for eschewing the microcontroller and rolling this old school. Not that there’s anything wrong with IoT fridge and freezer alarms. How Many Watts Are You Using? One of the best smart home hacks is implementing an energy monitor of some kind. It’s easy enough to say that you’re trying to save energy, but without the cold hard data, it’s just talk. Plus, it’s easy and a great way to build up something DIY that the whole family can use. [Bogdan] built up a simple whole-apartment power monitor from scratch over the weekend, and he’s been nice enough to walk us through the whole procedure, starting with picking up a split-core CT sensor and ending up with a finished project. Have you ever put a load of dirty clothing in the washing machine and set the cycle running, only to forget all about it and discover a mouldering congealed mass in the machine a few days later? [Xose Pérez] has more than once, and to stop it happening again he’s got a project that monitors the machine in his basement and notifies him when his wash is done. At the centre of his washing machine monitor is an ITead Sonoff IoT mains on-off switch. This device contains a 10A mains relay, an ESP8266 chip to control it, and a small mains switch-mode power supply. The Sonoff doesn’t use the ESP’s ADC pins, so he’s broken one of them out on a lead to a current transformer which captures the power level being consumed by the washing machine. The Sonoff is one of those IoT devices that relies on a proprietary cloud service and doesn’t have its own API, so [Xose] has created his own firmware for it incorporating an ESP port of an Arduino current sensing library. To round off the project and because he could, he’s added an ambient humidity sensor to the device. The resulting boxed-up unit returns minute-by-minute current readings for the entire wash cycle. To spot when the cycle has finished, he waits for a moment when it has been using no power for more than five minutes, at which point his Node-RED system sends him a notification via Pushover. This project is a very neatly executed hack on an extremely cheap piece of hardware whose capabilities would ordinarily be somewhat curtailed due to its proprietary interface. Surprisingly it’s not the first laundry monitor we’ve seen here at Hackaday, we’ve had this apartment laundry monitor using an accelerometer and a Raspberry Pi, and a notifier for a finicky dryer that insisted on stopping mid-cycle. We’ve had quite a spate of home-brew energy meters on the tip line these days, and that probably reflects a deep inner desire that hackers seem to have to quantify their worlds. Functionally, these meters have all differed, but we’ve noticed a distinct stylistic trend toward the “Nixies and wood” look. Ironically, it is refreshing to see an energy meter with nothing but a spartan web interface for a change. Clearly, [Tomasz Salwach] had raw data in mind as a design goal, and his Raspberry Pi-based meter delivers. After harvesting current sensing transformers from a bucket of defunct power meter PC boards, [Tomasz] calibrated them with a DIY oscilloscope and wired them and the voltage sensors up to an STM32 Nucleo development board. Data from the MCU goes to the Pi for processing and display as snazzy charts and GUI elements served internally. [Tomasz] was kind enough to include a link to his meter in his tip line post, but asked that we not share it publicly lest HaD readers love the Pi to death. But we can assure you that it works, and it’s kind of fun to peek in on the power usage of a house in Poland in real time. It’s a nice project that does exactly what it set out to do. But if you missed the recent spate of Nixie-based displays, check out this front hallway meter or this one for a solar-power company CEO’s desk. [Renaud] built a AC power meter from scratch. While commercial power meters like the Kill A Watt are available [Renaud’s] build gives an interesting insight into the methods used. At the heart of [Renaud’s] design lie two sense transformers. The first is a typical voltage stepdown transformer. This brings the AC line voltage down to +/- 10V, which is more amenable to digital sampling. The second is a current sense transformer. 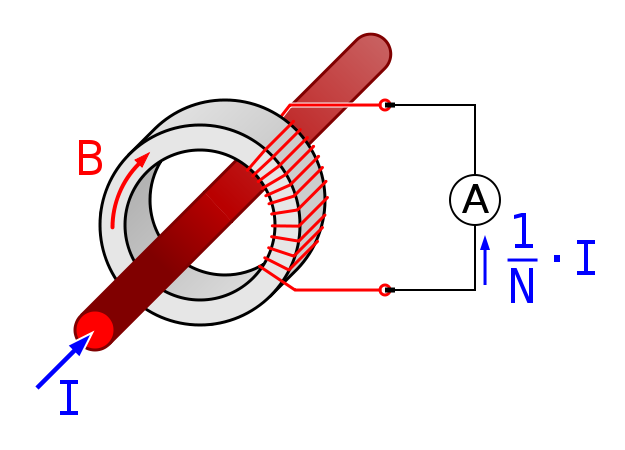 In current transformers the primary is typically a single wire (the AC line in this case) passing through the middle of a ring (see the picture to the right from wikipedia). The secondary is wrapped round the ring. When the secondary coil is shorted a current in the primary wire/coil induces a current in the secondary coil. In practice, the voltage drop across a low value resistor is used to detect the current in the secondary. Clamp meters use this principle to make non-contact current measurements. Other power meters often use hall effect sensors for current measurements. It will be interesting to see how these methods compare when [Renaud] benchmarks this build. [Renaud] takes the voltage and current readings from these transformers and samples them with a PIC in order to calculate power. As the AC voltage is periodic [Renaud] uses a method similar to Equivalent Time Sampling (ETS) to combine waveforms from multiple cycles and increase the effective sample rate.